For me Permaculture is a philosophy of solution based holism and a directed path for our enthusiastic approach to manifesting positive change in the world. It’s about realizing the full potential of humanity from uncovering the magic behind nature while leveraging the patterns and flows of energy that produce abundance. Redirecting that insight into every system, may it be buildings or banking, is key within our actions so we are poised to continue the great turning, or peaceful transition. This philosophy above shows a bit of Bill Mollison’s eastern influence and the idea of rolling with the energy thrown at us by nature. Bill refers to that in his opening statements in Introduction to Permaculture with his analogy of permaculture being aikido and conventional development being karate. I feel this way as well when I approach nature and how I interact with the world. 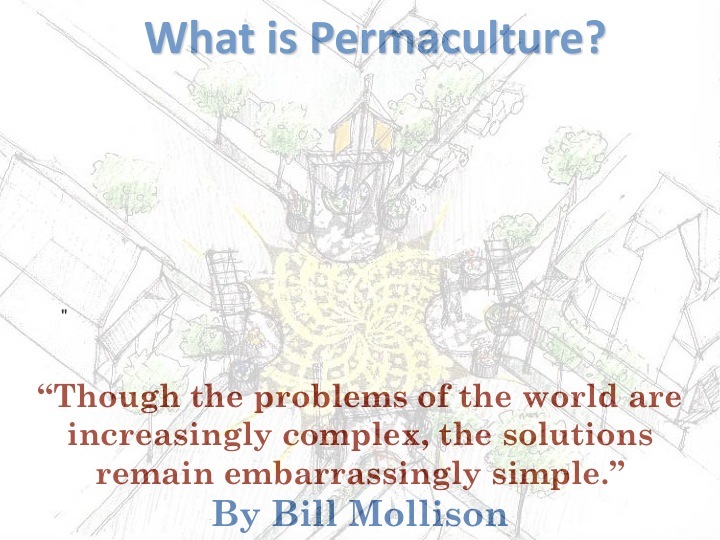 Permaculture gave me a path to develop a philosophy of my own which I appreciate as it itself is a mishmash of many traditions as Bill’s ability to synthesize and mix so to speak was truly amazing. He did it in a way where the philosophy meets action, which is something I really resonate with. And he smartly fused it with design as its role in society was becoming more and more evident. His statement below takes the philosophy and does exactly this, a statement of manifestation towards action through positive approaches. Rather than sink our energy into the fight against he urges us to take back our role as producers and strive towards what we do want. people and intertwining that with sharing our surplus, change can manifest from this ethical basis. From there we need principles to help us make design decisions and channel creativity matched with information. The principles are modeled after natures inner workings thus a pattern based representation of how nature functions in time and space can be applied. From there we get out in the field and implement strategies and techniques to bring the thought and creative work done inside out into manifestation processes. This is where a collection of tools from all sorts of different ecological frameworks like organic gardening and biodynamics come in to form a holistic development model. Our role as designers also is climate and context dependent, meaning there is no rubber stamp to development within permaculture. We have to take all of these things into account and more to really see the interconnections and the abundance that follows. In other words we move from patterns to details. We use a design process but there are also skills involved in being a designer and transmitting that to the field. Even when in the field you are always designing in that moment in time. The drawing in the design studio is a guide but in the field the magic of transformation happens. Re-evaluation is a constant so as we go along the design is dynamic taking into account all of the nuances that playing in the dirt takes into account. When you couple that with social and economic factors Permaculture design becomes one of the more complex design fields in the whole entire world. On the slides below you will see a mix of designs and work in the field plus statements from Capra based off of research on Leonardo Da Vinci and what it means to be a designer. Da Vince was a master designer and insight into his genius can give us guidance to what our role should entail. Thus we finish with our Permaculture definition which can also be seen in more pictures if you click here. Each person can develop their own definition so i encourage you to see this one as just our approach to permaculture while yours maybe different. Take the time to write your own and see how it evolves over time just as we have done. Enjoy and also check out more on Permaculture as a design science by clicking here and a artistic glimpse into most of what entails the holistic development model by clicking here. Permaculture is the harmonious integration of all life kingdoms into agriculturally productive ecosystems and socially just environments producing sound economic outcomes through systems management. It is a regenerative design intention reflecting patterns in nature that seeks to build interconnections allowing for energy efficiency and abundance of yield. Thank you for all of this information! I am now discovering permaculture, and your definition is a great fit for me. I live on one and a quarter acre in sw Florida, have some plantings going on, but more haphazard than not. Looking forward to doing some designing and reshaping, as I learn more. Thank you for posting this sir . Can i order the whole booklet and if you have dvd’s too. I am a resident of reno , nevada and usually work here from the month of april to november during golf season . I usually go back to my country in palawan, phillipines from the month of november to march to take care of my farm ( 40 acres ) I was fortunate to acquire this twenty years ago . This is located near the famous tourist destination called estrella falls ( 64 falls from the top ) My intention actually is to introduced permaculture in my community the poor farmers to learn sustainability farming for there needs . I will be retiring in this place hopefully next year . BTW , the property is beside the river bank about 700 meters long and near the main road too and i think this is very ideal for permaculture or maybe a food forest too ! Your materials will be of great help sir . I will be waiting for your reply…God bless ! Hello Jim i am hoping within the next year we will have the whole thing done and downloadable. We will have portions available for download in the coming year eh. Videos we are starting on as well. Thanks for your support. The land sounds amazing! Good luck with your journey on that one and let me know if you have any questions.